You can run but you cannot hide … the man hunt for accused murderer Desmonte Leonard has come to an end. 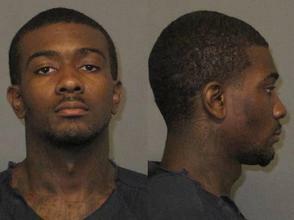 The three day man hunt is over as accused Auburn, AL shooter Desmonte Leonard has turned himself into police. As reported at Al.com, Desmonte Leonard is in the Montgomery County Jail tonight after turning himself in at 7:57 pm. Auburn police chief Tommy Dawson stated, “You can run for only so long, I hope the pressure we put on helped him turn himself in.” Attorney Susan James said that her office arranged for Desmonte Leonard to turn himself in at a Montgomery courthouse after getting word that his family wanted her help. James stated that “when the full story is told, it may sound different than the perception now.” Hardly, there are three people dead and her client has a past history with firearms. Although James told the AP that the Leonard family has not formally retained her. Leonard was charged with three counts of capital murder and three counts of assault. .
SWAT teams searching murder suspect Desmonte Leonard, the man charged with fatally shooting three people near Auburn University, stormed an Alabama house Monday where they believe Leonard was hiding. Police left the scene without arrests. Desmonte Leonard is wanted on three capital murder attest warrants. Authorities searching for a man charged with fatally shooting three people near Auburn University swarmed a house Monday where they believe he’s hiding, firing tear gas and sending a tactical team on cautious forays inside. Police had hoped to flush out the person with tear gas and verbal commands, but sent in the tactical team after getting no response. They’ve used thermal imaging and other technology to narrow down what part of the attic he’s in. The attic is cramped, complicating investigators’ efforts. Previously, Auburn police said 18 year old Jeremy S. Thomas of Montgomery, AL was charged with hindering prosecution after he fled the scene of the shooting with Desmonte Leonard. Yet another shock, this thug has a record too. Montgomery police also stated that 41 year old Gabriel Thomas was charged with hindering prosecution after having contact with Leonard after the shooting and providing false information to officers. Jeremy Thomas, 18, of Montgomery has been charged with hindering prosecution and allegedly fled with 22-year-old Desmonte Leonard, the man police suspect in the shooting, from University Heights apartments Saturday, Auburn Police Chief Tommy Dawson said. Dawson said Thomas is now being questioned by Auburn police officers. He said approximately 35 officers are actively working with Montgomery police and other law enforcement agencies in the search for Leonard. The charge against Thomas comes a little less than a year after he was arrested on murder charges for the June 16, 2011, shooting death of a teen in Montgomery, according to court records. Although he was originally charged with murder, he was out on bond and is scheduled to go to trial for manslaughter next week. SURPRISE, SURPRISE, SURPRISE … NOT! A man sought by authorities in connection with a shooting near Auburn University that left three people dead and injured three others, one critically, has previous arrests for gun offenses, but was never prosecuted, according to media reports Monday. Desmonte Leonard, 22, of Montgomery, is the subject of a multiagency manhunt that stretched into its second day Monday. Leonard faces three charges of capital murder in the shooting late Saturday at an off-campus Auburn, Alabama, apartment complex, police said. From The Opelika-Auburn News: Court records show Leonard has a criminal past with guns at the root of the crimes. Is anyone really shocked that this thug punk escalated his violence to include murder? This is what happens when you do not throw these low life’s in prison from the outset. Leonard’s criminal history is one punctuated with gun violence, according to court records. He was charged with carrying a pistol without a permit and theft in 2008 as well as second-degree assault in 2009 for shooting a 16-year-old in the groin. Montgomery County grand juries did not indict Leonard on the theft and assault charges. Court records also show two child support claims against Leonard, the most recent on Friday. Anyone with information concerning Leonard’s whereabouts is asked to contact a command post set up by Auburn police, U.S. Marshals and the FBI in Montgomery at 334-223-5400.